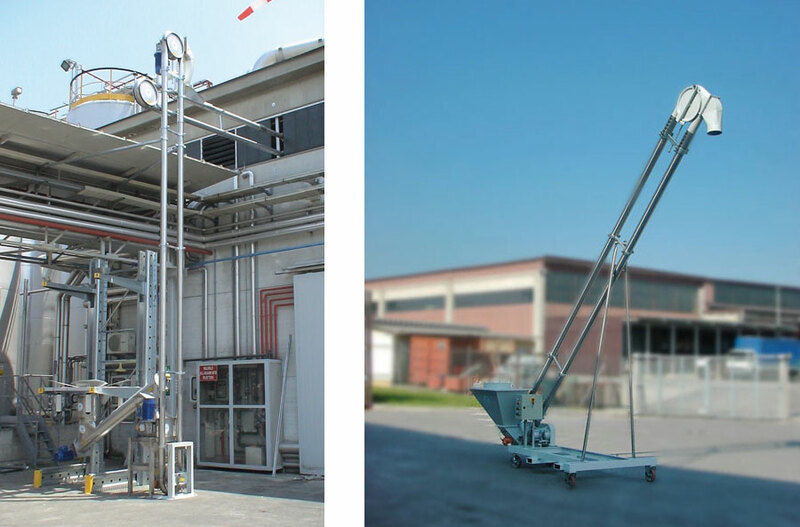 HiWay aero-mechanical conveyors are widely used for the transport of powders and granules of various kinds. 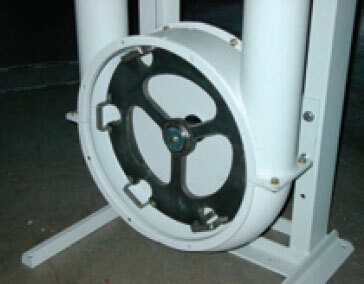 They are composed of two or more special housings connected by tubes and fitted with particular sprockets, which turn the rope passing it on to the conveying tube. The plastic discs fixed on the cable at regular intervals create discrete air pockets as they travel along the tube. Materials are conveyed with the minimum of degradation and separation, which is particular important with friable and fragile products. The high linear speed of the aero-mechanical conveyors impressed on the discs is such as to create an air displacement capable of fluidifying the material and therefore of transporting it with extreme ease. Low energy consumption, thus obtained, positive high performance and high yields. In the aero-mechanical conveyors the discharge of the product and the separation from the air generated during transport takes place by centrifugal action. By means of a special discharge curve, the outflow of the material is overcome and the air is instantly brought back into the circuit. The free circulation of resources in the environment, the possibility of having products with different weights and with ease, with existing systems, efficient, reliable, environmentally friendly and highly versatile aero-mechanical conveyors. HiWay for aero-mechanical conveyors like all its products it uses high quality materials. The corners are made of mild steel or AISI 304 or 316 stainless steel. 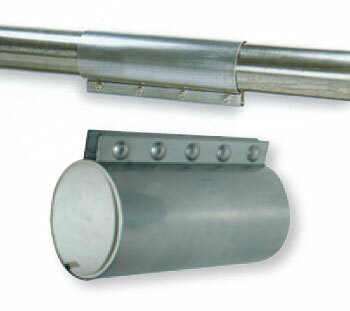 Tubes and ropes are made of galvanized mild steel or stainless steel, the discs in polyurethane, nylon, etc. The low power requirements (see table), the minimal maintenance, the simple assembly, the light design, the modular construction and the high performance of the system make HiWay aero-mechanical conveyors highly adaptable to meet the most particular challenges. This family of conveyor distributors has the same design features as the high-speed aero-mechanical conveyors, but operate at low speeds and the materials are conveyed into the tubes by disc chain or cable. The rational design guarantees a highly efficient and versatile system with angles of operation from 0° to 90°. The tubular construction – first section horizontal, second section vertical – is fitted with one or more inlets and with tubes arranged vertically or horizontally side by side. 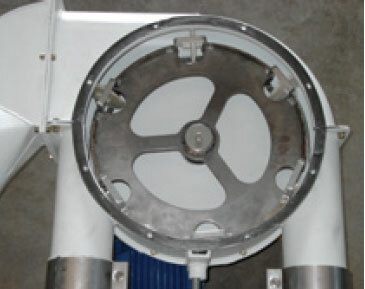 This solution is designed for feeding two loading hoppers, simply inverting the drive unit rotation. 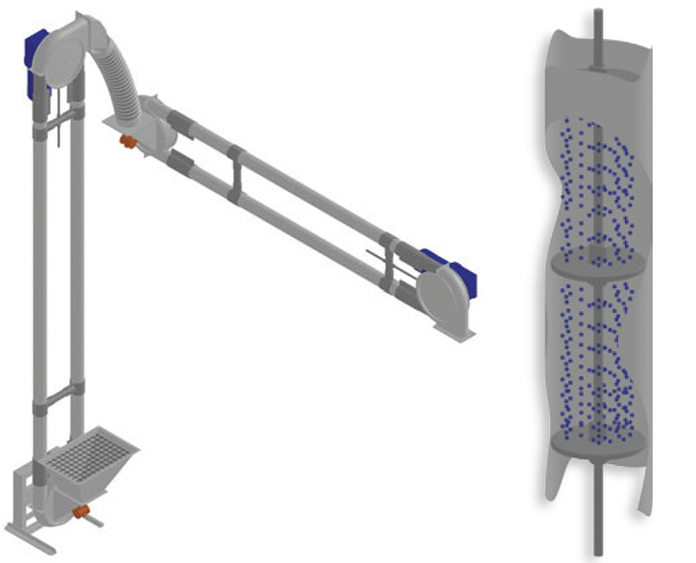 The TDN distribution conveyor is operated at slow rotating speed of the cable within the tube; it is fitted with multiple outlets and pneumatic or manual cut-off valves and has similar accessories to the aero-mechanical systems. 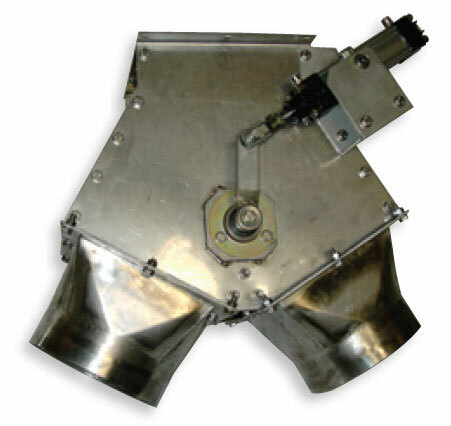 Intake hopper with vibrating device. Example of standard mild steel corner. 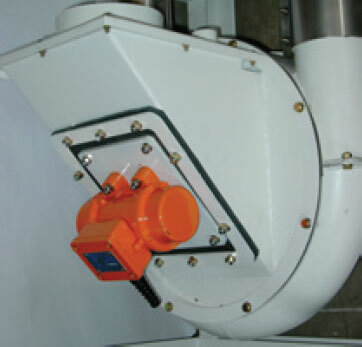 Connectors are used to connect the conveying tubes. Assembly is fast and they guarantee solidity to the tubular construction, a dust-free handling environment and ensure electrical continuity for the grounding. Example of pneumatic diverter valve. HiWay conveying systems are installed in a wide variety of industrial branches including: chemical, food, recycling, rubber, plastics, wood, paper, tanning, paint, ink, adhesives, foundry etc.